Currently viewing the tag: "Titanic"
The 1980s was the Golden Age of newspapers. In that greedy decade the Los Angeles Times, where I thoroughly enjoyed working as a copy editor and freelance writer/reviewer, was a major national media power. Its profits were obscene. It still had about 1.1 million readers and more international bureaus than the CIA. It could afford to pay top writers $50k a year to write three mega-stories per annum that were too long to read, or assign two investigative reporters to the Scientology beat for years without them ever printing a word. It had about 1,100 editorial employees then, more than twice what it has now. Today the Times is like most dinosauric daily newspapers in the post-Digital Age. It’s shriveled and sickly and still unable and/or unwilling to adapt to the Internet and its culture of openness. It’s too late. Culturally and politically, the L.A. Times is nationally irrelevant and cloutless. Worse than Time or Newsweek. The Times and its bankrupt corporate daddy the Tribune Company are up for sale for about $600 million — a fire-sale price. As a libertarian, and as the only open libertarian I knew working at the Times in the 1980s, I hope the fabulously rich libertarian Koch brothers buy the paper with their pocket change and give some of my few surviving liberal friends there a taste of their own medicine. It’ll be interesting to see how my fellow journalists react to having bosses — i.e., devout libertarian/conservative publishers and the non-liberal editors they will certainly hire — who don’t have the same political biases they have (and don’t know they have). The Times, as any non-Obama-loving reader or non-liberal journalist knows, desperately needs some more ideological diversity (ID) — on its editorial pages but primarily among its subeditors and reporters. It needed ID in the 1980s. I’m sure it still does. All big-city papers always did and still do. Meanwhile, rooting through my Los Angeles Times archives the other day I found shocking evidence of just how far the mighty L.A. Times, aka the Daily Titanic, has sunk in terms of what it once spent on the gathering and spinning of news and opinion. Two nicely typed pages detail the Times’ enormous 1982 editorial budget (which included my paltry $30,000 a year salary as a part-time copy editor in Calendar, the arts & entertainment section). A lousy $45 million isn’t much in an age of $3.5 trillion federal budgets. But it’s about $105 million in 2012 dollars, which is almost enough to buy what’s left of the L.A. Times itself and about a sixth of the price the whole Tribune Company and its eight papers is expected to go for. 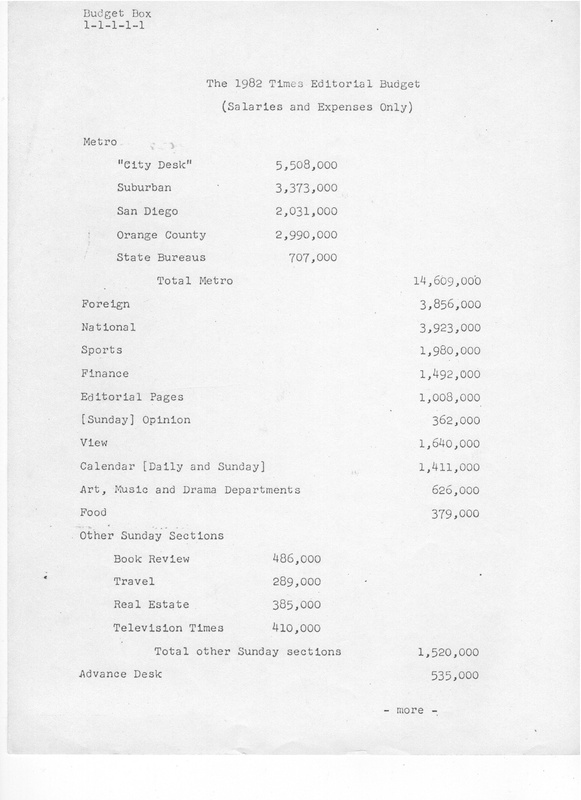 The 1982 budget report looks like just a bunch of big boring numbers to civilians. But it’s a real shocker for the survivors of the Great Daily Newspaper Crash. They will scream and cry and remember the good old days before blogs and tweets democratized journalism and made everyone with a thumb an amateur George Will. Almost $15 million spent for the Metro desk (local news) is impressive, even in 2013 dollars, but not as impressive as almost half a million for a stand-alone Sunday book section. Today there’s hardly a book section still alive in a North American newspaper. A cool $1.1 million for the Times in-house library. A million bucks worth of editorial writers. 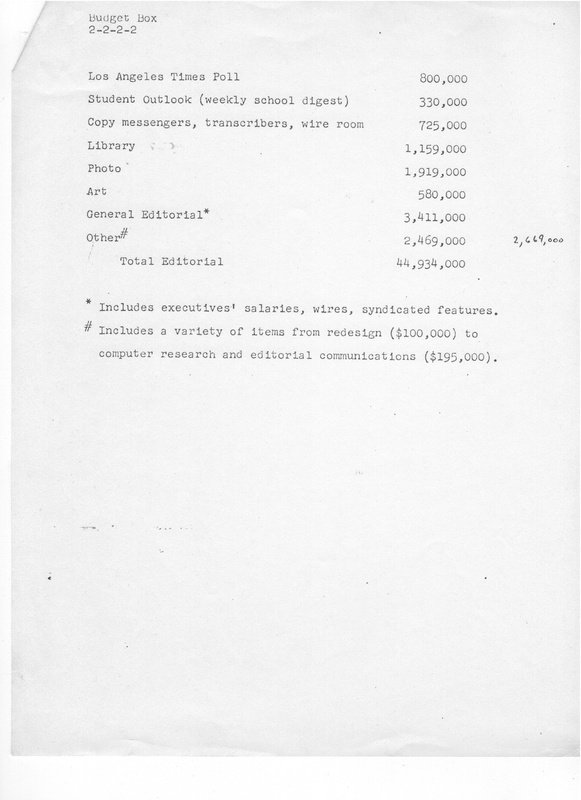 More than $700,000 for copy messengers, transcribers and the Times newswire. Email, the Internet and PCs put many of those people out of their jobs and should have saved the Times a ton of money, if only the paper had been managed well. But by the beginning of the reign of Bush II, the Times had upwards of 1,300 well-paid editorial employees and was about to hit the iceberg. In the 1980s, the Times was known as “The Velvet Coffin,” and for good reason. No one ever left it until they died, landed a job at the New York Times or got themselves hired by big Hollywood producers, which movie reporters Michael London, Dale Pollock and David Friendly did during my time there. The L.A. Times paid everyone New York Times/Washington Post salaries and nobody ever had a heart attack from overwork. A lot of money was spent on good journalism, but a lot of money also was wasted. I remember Picasso prints in the mid-level editors’ glass offices. I don’t remember where or how I acquired my copy of the 1982 budget report, and even if I did I’d go to jail to protect my sources. But truth be told, I probably swiped it off the desk of the Times’ late, great and under-appreciated Sunday Calendar editor, Irv Letofsky. Or I fished it out of his trash basket when I was emptying it for him. All I know for sure about the budget is that it’s authentic. And it’s a sad document from a happy newspaper era we will never see again. Bill Steigerwald, whose columns and commentaries are archived at CagleCartoons.com, worked at the Los Angeles Times in the 1980s, the Pittsburgh Post-Gazette in the 1990s and the Pittsburgh Tribune-Review in the ’00s. 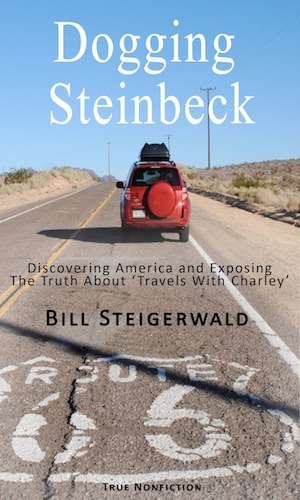 He is the proud author of the Amazon ebook “Dogging Steinbeck,” which exposes the truth about john Steinbeck’s “Travels With Charley” and celebrates Flyover America and its people. Many book details at TruthAboutCharley.com or go to C-SPAN for his “Q&A” appearance with Brian Lamb.